Pierce Homes is currently hiring a Professional Sales Consultant to join our team!! Our growing company is adding to our professional Sales Team. These lucrative positions rarely come available. Earn what you are worth by selling modern factory-built modular and manufactured homes. We market high quality homes, multi-family structures and commercial buildings. These high-paying positions requires professional level selling skills, a proven track record, excellent communications skills, PC proficiency and a customer Service focus. Are you tired of just making $40,000 to $50,000 a year?? Our top producers earn over six figures a year!!! Responsibilities: Service existing accounts, obtain new orders and establish new sales by planning and organizing daily work schedule to call on customers Ensure that all transactions have the necessary paperwork, signatures, dates and all stipulations are met per the contract Keep an accurate tally of all customer traffic Ensure sales goals are met and margins are maintained Enter new and existing leads into our current customer management system Contribute to a team effort Stay current on product knowledge and safety procedures Perform and maintain inventory and lot appearance, including snow removal, sweeping and boardwalk maintenance Qualifications: Ability to perform work accurately and thoroughly Ability to communicate effectively with others Ability to find a solution for or to deal proactively with work-related problems Basic Computer Skills Closing skills, Time management, prospecting skills, negotiation techniques and highly self-motivated Pierce Homes offers: - Outstanding Earning Potential - A Training Salary - 401K - Health Benefits - Paid Time Off - Life Insurance - Company discounts and more...... Pierce Companies is a local owned, family business that has been serving MT for over 90 years. 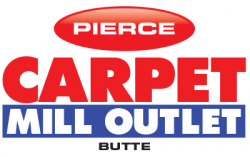 Pierce Flooring is expanding their sales team!! This will be an inside / outside sales position. In addition to working with walk-in traffic the ideal candidate will also be creating outside sales with visits to contractors, realtors, property management and Main Street commercial. This person will be highly self- motivated, experienced in sales, enthusiastic, able to work in a team atmosphere, organized, and have a strong desire to succeed. This is a full-time position which will include some Saturdays. There is a guaranteed salary of $36,000/year! Responsibilities: Greet & assist customers in buying process Networking & community involvement to promote sales growth Take accurate measurements Follow up with your customers to ensure all their questions are answered Attend all sales meetings Manage and follow sample check out procedures Work with manager to set a sales goal and work to meet this goal monthly Performs other related duties as assigned * Qualifications: Ability to perform work accurately and thoroughly Have great customer service skills Must have great communication skills Able to find a solution for or to deal proactively with work-related problems Ability to use and read a tape measure and perform accurate job site measures Ability to work under pressure Basic computer skills Pierce offers a great benefit package which includes: -Training Program - Outstanding Earning Potential - 401K - Health Insurance - Personal Time Off (PTO) - Group Life Insurance - Company Discounts and more Pierce is a MT based, locally owned company that has been serving MT for over 90 years!! Pierce is looking for a team oriented individual to work in our warehouse . If you are dependable and like to work in a team atmosphere, this job may be the job for you! Candidate will help in all aspects of the warehouse, including deliveries and vendor pick-ups. Will also have the ability to learn the flooring industry and our flooring software. Candidate must have a valid driver’s license and forklift experience is a plus but will train. Responsibilities: (But not limited to) Unload delivery trucks Ensure customer/installer is loaded out in a timely and friendly manner Inventory control and inspect materials for damage Ensure that all merchandise loaded on trucks is the correct product for each job Tag and store incoming materials Label initial quantity of merchandise Cut stock rolls and pad Stage materials for installers Load trucks for installers Clean and organize warehouse Monitor emails for store transfers Qualifications: Ability to perform work accurately and thoroughly Good communication skills Problem solving Customer service oriented Organizational Skills Pierce offers: - Competitive wages - Health insurance - 401k - Paid Time Off - Life Insurance - Company discounts and more .... Pierce is a family owned business that has been serving MT for over 90 years.